Once a year, every former and current American worker aged 25 and older receives a statement in the mail that summarizes the estimated benefits they will receive upon their retirement or death. I now have a stack of these that I’ve organized — by date — in a file cabinet. I know that when my retirement date comes, it will be interesting (if not humorous) to look back through those reports and see how accurate they ended up being. In addition to these automatic mailings, workers of any age can also request a Social Security Benefits Statement from the Social Security Administration. Here’s how to view your Social Security benefits online. Help with your long-term financial planning. Ensure that your information is correct and up-to-date. Inform the public of disability protection and death benefits allowed to the family. You might be inclined to just drop those Social Security Benefits Statement directly into the trash. 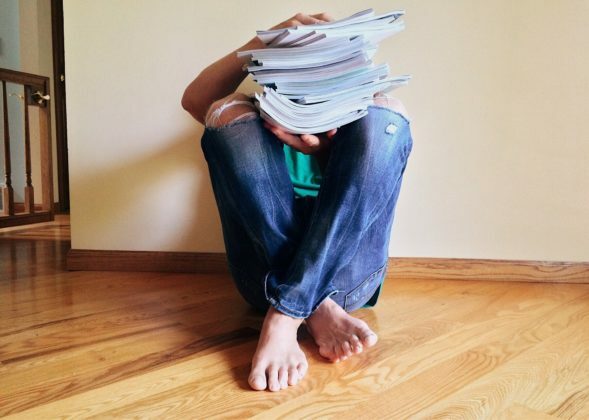 But here’s what you should be doing with those annual earnings statements instead. You’ll learn about the social security program — including its current status and the future of it. You’ll get an idea of how much money you can expect each month when you retire (or if you become disabled). You’ll learn how much money your family members will get if you die early. You’ll learn if you will qualify for Medicare benefits at 65. #2 – Check it for errors. You also need to examine your earnings record — to make sure that all of your wages have been reported correctly so far. This will ensure that you’ll receive the correct social security benefits when you retire. #3 – Use it to plan for your future. Since your Social Security Statement will tell you how much money you can expect to get based on the age you retire, it will help you plan early for your retirement. 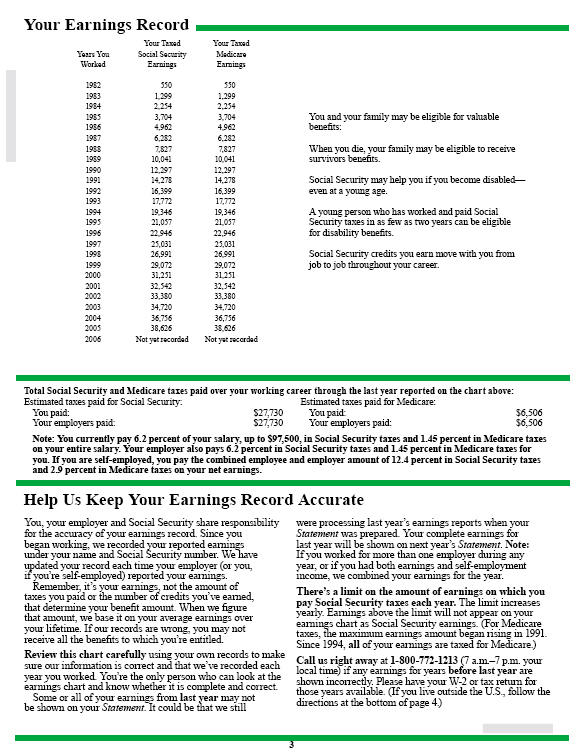 Your Social Security Earnings Statement will help you decide how much more money you need to save or other goals you will need to meet for a comfortable retirement. For example, if your Social Security Statement sample says you will receive $1,761 a month, but your current budget is $3,000 a month, then your investments will need to provide another $1,239 a month. Perhaps you also can plan to lower your expenses by paying off your home, and eliminating other expenses to get your monthly budget closer to the amount you will receive. #4 – Keep it somewhere safe. Keep your Social Security Statement sample in a place where you will easily be able to find it. You might want to keep a copy in a safe deposit box, or perhaps store it with your yearly income taxes. 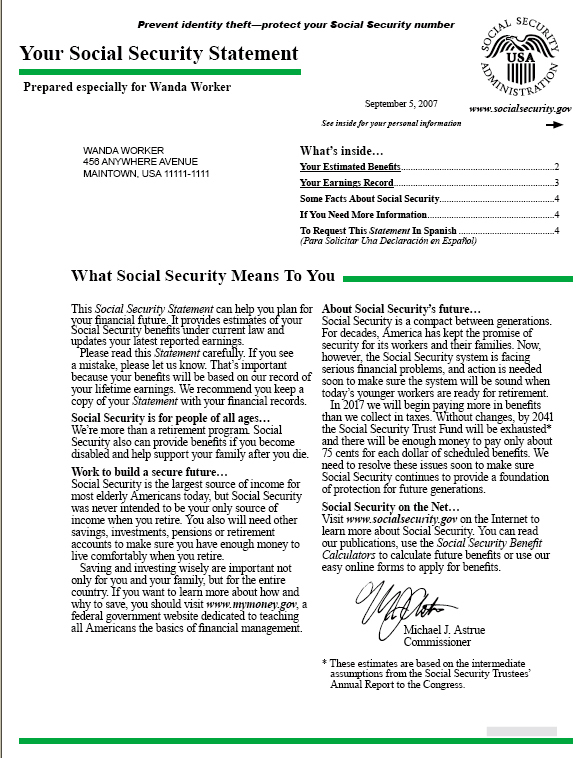 When reading through your Social Security Statement, you may see a rather serious notice. It’s a disclaimer that basically says the future of social security is in danger, and they may end up paying 25% less benefits than promised. This is something to keep in mind when saving for your retirement. To help you decide how much money you should be putting toward retirement, there are numerous calculators online that you could use. 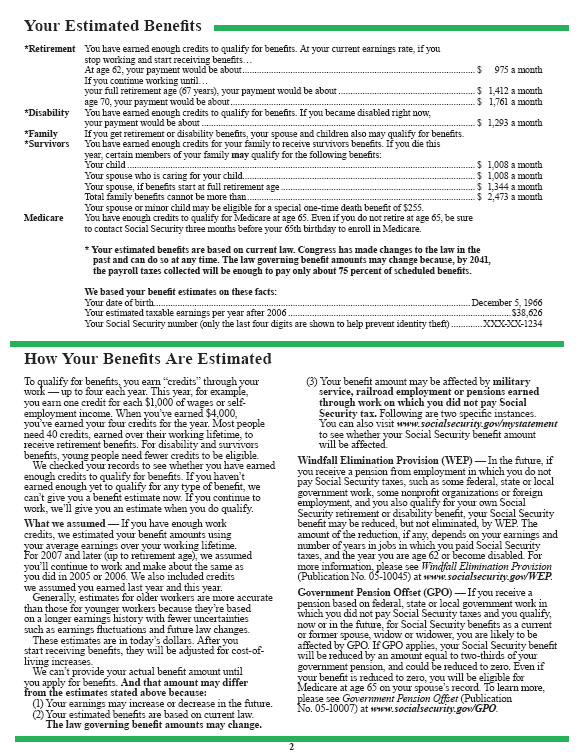 Use this Social Security Benefits Estimator to get an idea of how much you are likely to receive from social security. Can a former spouse claim your Social Security? Q: I divorced my wife 23 years ago. Now she wants to claim my Social Security. Can she do that, and will I get less as a result? Are your Social Security retirement benefits in jeopardy if you earn money after officially retiring? Q: Will I get penalized for working while collecting Social Security retirement? 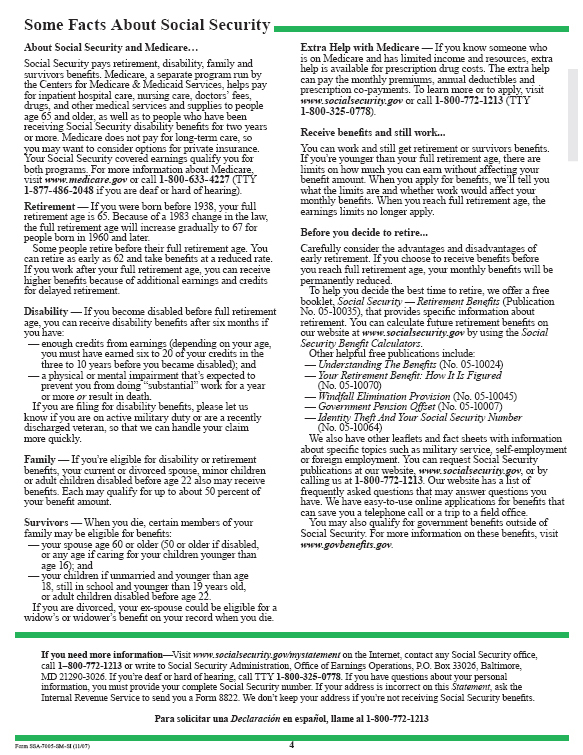 For more Social Security benefits Q&A, check out the Social Security Administration’s FAQ Page.